Terrazzo is a composite material commonly used in flooring applications, but also for wall surfaces, gardens, finishing panels and so on. It is derived from the Latin word ‘terra’, meaning ground. Terrazzo is traditionally constructed by exposed chips of hard materials set in a surface of concrete or epoxy resin, polished until it is smooth. The chips are typically marble, quartz, glass, granite and so on. Terrazzo can be poured in place, with additional chips sprinkled on top before the mix sets. It may include metal strips to divide sections or colour/pattern changes. After curing, a uniformly textured surface is achieved using a grinder, with slight depressions filled with a matching grout material, hand-trowelled before the whole surface is cleaned, polished and sealed. It can be also be precast and applied as tiles or panels. 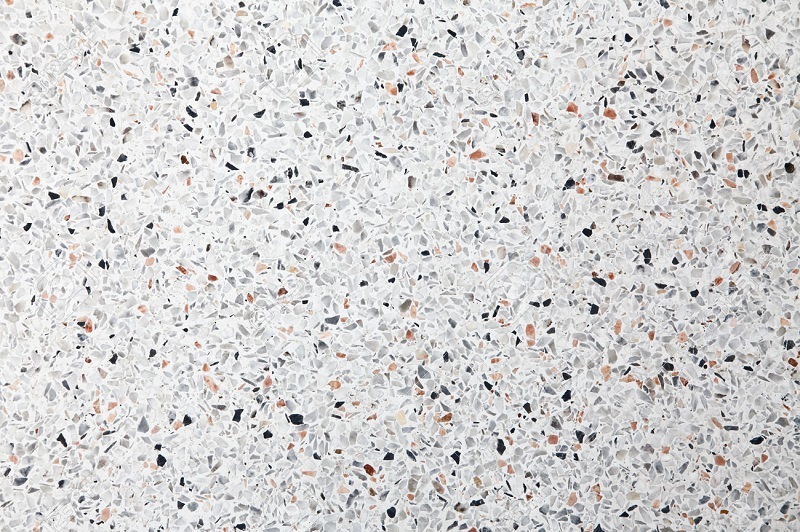 Terrazzo originates from Venetian construction, where it was a low-cost flooring material formed using scrap marble. In the 1920's the development of powered equipment such as grinders allowed more widespread terrazzo production. Thin-set, epoxy terrazzo was introduced in the 1970s and has the advantage of allowing a wider selection of colours, and being much thinner, lighter and stronger. However, it is generally only used for interior applications as it tends to lose its colour outside. Terrazzo is often used as floor tiling in public buildings due to its long-lasting qualities and its ability to be refinished when required. It can achieve a very wide array of aesthetics depending on the chips that are embedded, with almost any design or colour being possible. Once sealed, terrazzo is impervious to water and staining and is resistant to chipping unlike other tile materials. However, it can be quite slippery which creates a risk of falls. Additives can be included to make it more slip-resistant.